I woke up to a frosty, foggy morning on the train, where I spent the better part of an hour near the door, gripping on to the icy railing as the hard, cold wind whipped against my knuckles, rendering them numb, listening to Mergel early in the morning, over my JBL Tempo headphones, accompanied by the first hot cup of coffee of the day. Spent the afternoon conducting product trials for JBL, homing in on the younger crowd on the train, guys and girls who are also travelling to Kathmandu. Bid farewell to Prem Da, who got off at Gonda in U.P., I am to continue my journey to Gorakhpur with the two sisters from Kathmandu, who were in our carriage – two sweet young things by name of Chandni and Chahna. Should be interesting! 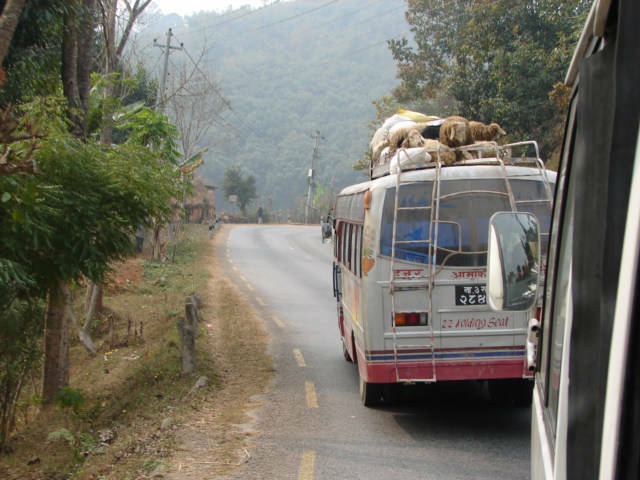 We deboarded at Gorakhpur and got a cab with two other Nepali guys, to take us to Sunouli, the Nepali border town, after which we will get a direct bus to Kathmandu in the evening. All that I saw of Gorakhpur! Had a sumptuous dinner at Sunouli waiting for the bus; as it turns out, Chahna was right in her vehement proclamation that Nepali food was infinitely better than Indian food, which was not worth even wrinkling her nose up for, a gesture that I later found out, is an idiosyncrasy of many hill peoples. The bus to Kathmandu was stewarded by a very hyper-energetic Nepali man, who stated with much disdain that I look much older than my 22 years, and insisted that I quit smoking cigarettes at the earliest. Hm, a lot of the signs seem to be converging!